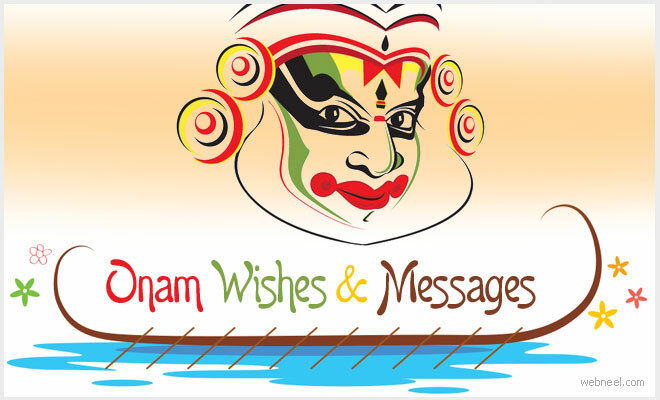 In this post you will find Onam Messages, Onam Wishes and Onam Quotes which can be used to greet people on the special occasion of Onam. Onam is a harvest festival celebrated in Kerala. Onam festival is celebrated for 10 days and the last day is ended witha great feast(sadhya). Every malayalee's house(Kerala/International) is usually decorated with colorful rangolis to welcome Maveli, who is a mythological king of kerala. During Maveli's rule, there was no theft, poverty and people lived in harmony. Onam crushes obstacles and joins people regardless of their caste in Kerala. 1. May the Spirit of Onam festival guide and light your way to the path you choose. 2. Onam is a perfect time for family to bond. So this year’s Onam, I wish you and your family to have a good time. 3. May the Onam festival be the start of your successful life. Wishing you and your family a blessed onam! Complete it with prayers to have a blessed year ahead till next Onam festival. 5. Air is filled with joy and zeal. Homes are adorned with colorful embellishments. But I hope that Onam is not just about that. I hope that the spirit of Onam fill your heart with happiness and fulfillment. you have always wished for! and your family a very happy Onam festival! I’ll be there to celebrate this fun celebration with you. 8. I maybe miles away, but the spirit of Onam will always stay in my heart. So, let’s celebrate this Onam festival by heart and by soul. 9. Giving, sharing, loving and celebrating together – that’s the essence of Onam. May this year’s Onam celebration bring more fun to you and your friends and family. 10. May Maveli thampuran Visit your Home and bless you on this Home. May you have to most wonderful Onam celebration with your friends and family. Don’t forget to share those moments with me. I’ll just be here. Happy Onam. 1. Greetings From my family to yours… Have a colorful and happy Onam! 2. Sending my warmest wishes to your family this Onam festival. Have a happy and wonderful Onam! 3. I wish you to have a wonderful and blessed Onam. May your home be filled with joy, peace and happiness. Happy Onam! 4. May Your onam filled with Happiness, joy and Celebration. Happy Onam! 5. May the festival of Onam be the start of your colorful, healthy and happy life. Wishing you all the best this Onam! 6. Sending the most heartwarming Onam greetings to your way. May God guide and bless you with good health and good life. 7. Wish you all a euphoric, prosperous, colorful, healthy, wealthy and fun-filled Onam! Let this season brings you all lot of good luck, peace of mind, happiness and all that you wish! 8. Forever remembering thoughts of happiness & prosperity with all sweet Onam days. Happy Onam 2018. 9. As Kerala welcomes our dear King, I wish you an Onam, filled with Happiness and Joy My heartfelt Onashamsakal. you variety like the food at community luncheons. harvest of crop, relationship and happiness. for constructing an outstanding life. 5. Festivals bring family together. It gives reason to have fun one more time. A festival like onam brings prosperity to family. It gives reason to smile One more time. Happy Onam to you and your Family! 6. Another beautiful Onam has come..Let us all stay together and celebrate this day. Wishing a Very Happy Onam to all Mallus ! 7. The Onam is an occasion for people to remind themselves of the all pervasive nature of divine. I wish all your family members a Happy Onam & Thiruonam. 9. When Maveli, our King, ruled the land, All the people had equality. And people were joyful and merry; They were all free from harm. There was neither anxiety nor sickness, Death of the children was never even heard of, There were no lies, There was neither theft nor deceit, And no one was false in speech either. Measures and weights were right; No one cheated or wronged his neighbor. When Maveli, our King, ruled the land, All the people formed one casteless race. HAPPY ONAM. 10. Life becomes a festival when gaiety and culture blend. Onam delivers the message of both.